Escape to Myrtle Beach and enjoy relaxation in the Hibiscus Spa. Reserve our Spa Credit Package when you stay at the Myrtle Beach Marriott Resort and receive $100 spa credit for single service or $200 spa credit for 2 guests, plus overnight accommodations in a Resort View room or Partial Ocean View guest room. Book today with code SPA. 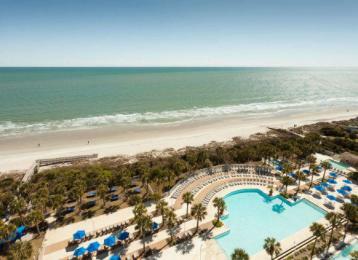 Plan a uniquely memorable luxury getaway to the Myrtle Beach Marriott Resort & Spa at Grande Dunes. Our resort, which boasts an unbeatable oceanfront location in North Myrtle Beach, is delighted to welcome guests with spacious, elegantly appointed guest rooms and an impressive range of luxury resort amenities to help you optimize your time in North Myrtle Beach.